Guruvayoor is among India's most important pilgrimage centres. It is known as the Dwaraka of the South. The Sree Krishna Swamy Temple, which attracts thousands of pilgrims is said to date, prior to the 16th century. Tradition has it that the temple was created by the Guru - the Preceptor of the Devas and Vayu, the Lord of the Winds. The temple is dedicated to Krishna known here as Guruvayurappan or the Lord of Guruvayur, and the idol is said to have been worshipped by Lord Brahma himself at Dwaraka. It is at this temple that Melpatur Narayan Bhattathiri composed his well-known Sanskrit devotional poem 'Narayaneeyam'. The temple is renowned for its healing powers. Several offerings are made to the deity here from the simple 'Archana' (offering of flowers) to the expensive and elaborate 'Udayastamana' pooja or 'Thulabharam' where a devotee is weighed against offering of bananas, sugar, jaggery or coconuts. Guruvayur is the site for weddings and Annaprasanam, the first feeding ceremony of a child. The temple, according to number of devotees per day, is the fourth biggest temple in India after Badari, Puri and Thirupathi. 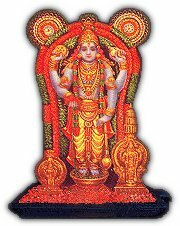 The deity Guruvayoorappan is Lord Maha Vishnu with four arms, even though the devotees worship him as Lord Krishna, the complete man incarnation of Lord Maha Vishnu. The eastern nada is the main entrance to the shrine. 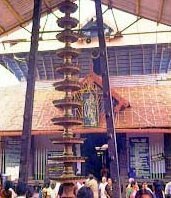 In the chuttambalam(outer enclosure) is the tall 33.5 m high gold plated wajasthambam (flag post). There is also a 7 m high dipastambham (pillar of lamps), whose thirteen circular receptacles provide a truly gorgeous spectacle when lit. The square sreekovil is the sacred sanctum Sanctorum of the temple, housing the main deity. Within the temple, there are also the images of Ganapathy, Sree Ayyappa and Edathedathy Kavil Bhagavathy. The walls of the sanctum sanctorum are inlaid with exquisite mural paintings and carvings.